Like many Americans, I make resolutions around the time of a new year. I don’t confine my goal-setting to the start of another year, but I do like to use this time to reflect on what I want to accomplish, and to look back on how my life matches with what I want it to look like. I like the idea of reflection, and then using the results of my introspection to create New Year’s resolutions. Normally, I pick one big financial goal for the New Year, and then two or three self-improvement goals. Last year, my goal was to try to get ready for the possibility of a move. This year’s big financial goal is to kickstart my dividend/income portfolio. These financial goals are nice, but what I really get excited about are the self-improvement goals because they add a little spice to my life, and, of course, improve my life for the coming year — and even subsequent years. I’ve had limited experience with Spanish and German, but I wouldn’t claim fluency. I’ve even had a little experience with Greek and Latin because of some of the things I’ve read and due to the fact that I deal in words every single day. But it’s hard going because I have to keep looking stuff up. I’d like to make a better effort at learning a new language. My hope is that I can get a little support by learning with my son. However, even if that doesn’t work, there are web sites and programs that can promote learning by allowing you to converse with native speakers. I’m excited at this prospect. SO, I don’t sing very well. I don’t expect to become a great singer, but I’d like to get better. I’ve taken guitar lessons in the past, and I play the piano. While I’d like to improve on these instruments, the reality is that I already practice. I don’t need to make a resolution to practice more. What I don’t know how to do with any sort of proficiency is to use my voice as an instrument. I think it would be a fun exercise, and something I would enjoy. Maybe, if I’m not too terrible, I could even accompany myself. Since I like singing, and I’d do it anyway, I might as well make it a less horrible experience for those around me. I’d like to rant more. I have a blog that no one reads. I rarely update it, but it focuses a great deal on politics and religion. I’d like more time to develop these thoughts and express them. Even if no one ever reads the blog. However, to be able to rant more, I’ll need to take more time to study and learn, and think about things. These serious thoughts that follow my interests would require me to stretch my mental capacity, and consider different angles and even, perhaps, require me to change my mind about things. This is a good thing. I’m gearing up for another year, and I see some interesting opportunities for self-improvement, as well as financial improvement. What are your goals for the coming year? 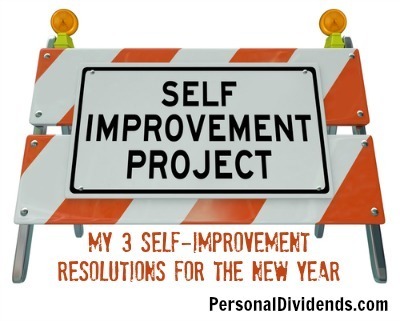 Do you have New Year’s goals aimed at self-improvement? Miranda, thank you for the article !